Antiques in general are almost always fascinating to look at and ponder, wondering whose hands the item passed through and speculating on its back-story and value. But an antiquity or ancient artifact is like an antique on steroids. We think of, say, a circa 1710 highboy as a very old item, but how about something from the 2nd century BC? Now that's old! And that's exactly what you're looking at here: a Roman marble herm depicting the Greek philosopher Demosthenes, created 2nd century BC. The bust is just over 13 inches tall and is in remarkably fine condition. It's Lot 106 in a Fine Ancient Artifacts Winter Sale planned for Sunday, December 4th, by Ancient Resource, LLC, online and at the firm's gallery in Montrose, Calif., at 10 am Pacific time. Ancient Resource, LLC conducts auctions that feature just ancient artifacts. It was formed in 2003 by Gabriel Vandervort, a former producer and writer of ancient history and documentaries for The History Channel, The Discovery Channel and History International. 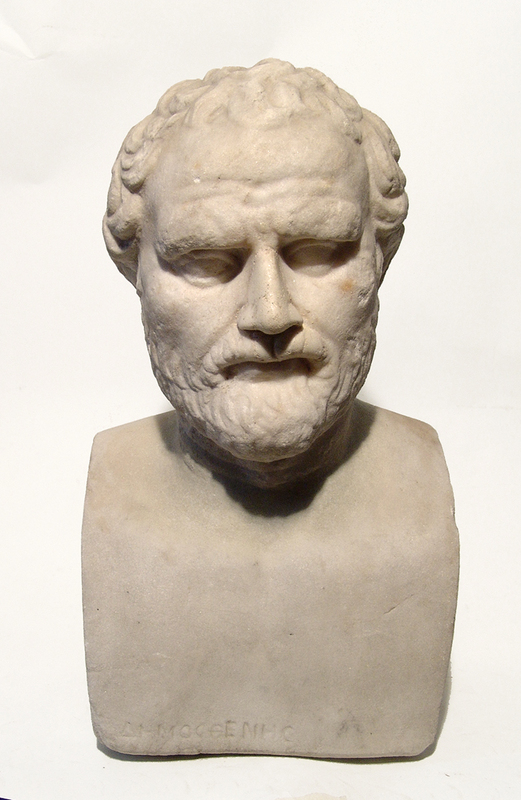 Oh, the estimate for the Demosthenes bust is set at $40,000-$50,000. Visit www.ancientresourceauctions.com. Mining artifacts isn't a category you see too often in auctions, but the genre does have a following among collectors and the category will be well represented at Holabird Western Americana Collections LLC's huge upcoming four-day auction event, Dec. 9-12, in Reno, Nevada. Some of the mining lots up for bid will include maps and stocks relating to the California Gold Rush (another major category in the sale), as well as carbide underground mining lamps, teapot lamps, stocks and ephemera. It's mostly from a single major collection that could fill a truckload. 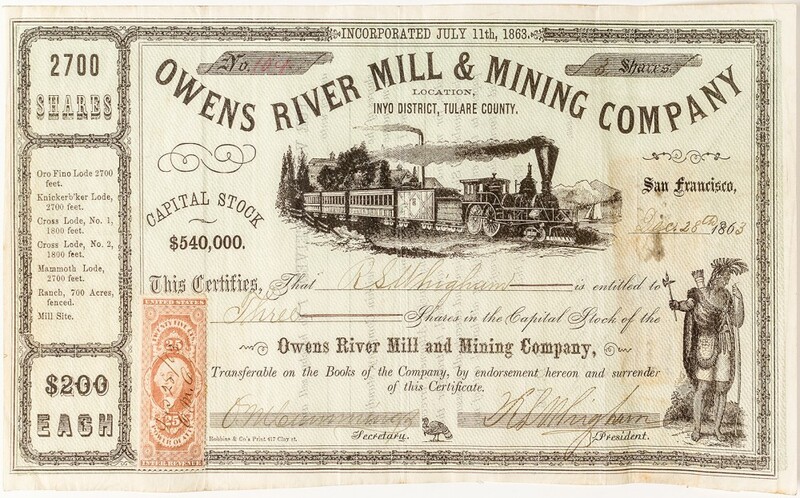 The item shown here is a stock certificate for the Owens River Mill & Mining Company (Inyo District, Tulare County), dated December 28, 1863, for 2,700 shares (at $200 per share – a princely sum back then!). The auction is a four-day monster: 2,500 lots in total, in categories that will also include taxidermy, Native American, numismatics, gaming, tokens, autographs, ivory items, militaria, Western cutlery (circa 1855 to circa 1880), antique bottles, maps, railroadiana, watches and jewelry, currency and scrip, cowboy, art and more. Visit www.fhwac.com. Potter & Potter, the Chicago-based specialists in magic auctions, will conclude 2016 with a sale titled Winter Magic: The Rex Conklin Library and Other Fine Conjuring Collections, on Saturday, Dec. 3rd, online and in the firm's Ravenswood Avenue gallery, at 10 am Central time. Items from the Conklin collection will include rare blow books, related photographs and ephemera. Also up for bid: conjuring props, vintage posters, a copy of Dean's Hocus Pocus (among other antiquarian titles), and unique signed copies of books by Houdini, autographs, antique prints and more. 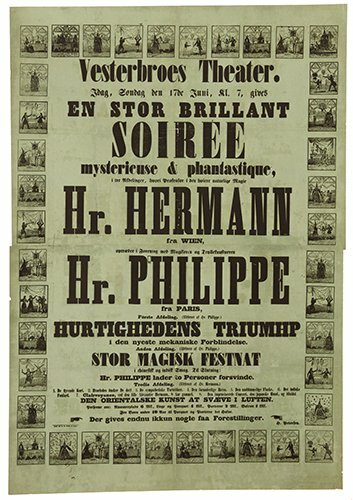 The poster you see here is an 1870s large-format woodcut and letterpress broadside in Danish and German, advertising a dual performance by the premier conjurers Herrmann, Compars and Herr Phillippe (Jacques Noe Talon) at the Vesterbroes Theater in Copenhagen, Denmark (est. $3,000-$4,000). Other lots will include a copy of The Discovery of Witchcraft by Reginald Scot, printed in London in 1665 (est. $8,000-$12,000); and an antique clown magician musical automaton made by Leopold Lambert in Paris, France (est. $8,000-$12,000). Visit www.potterauctions.com. Kaminski Auctions' annual two-day Thanksgiving auction, slated for Nov. 26 and 27 in Beverly, Mass., will feature the partial contents of the legendary Belvedere Guest House on Fire Island, N.Y. Antique furniture, objets d’art and paintings from this elegant neoclassical villa will be featured in the auction. Designed in the style of a Venetian villa, The Belvedere was resplendent with artwork and antiques gracing every nook, alcove and room. Items will include a 19th century classical marble bust of Robert Burns and several important paintings by Robert Bliss (Am., 1925-1981). Continental decorative arts will feature the 18th century French Louis XV basin shown here, decorated with carved putti and figureheads. It features a copper liner with embossed center. Originally purchased at Park Bennett in New York in the 1940s or '50s, it measures 39 ½ inches high by 58 inches wide and is estimated at $20,000-$40,000. Also sold will be a 19th century 24 kt. 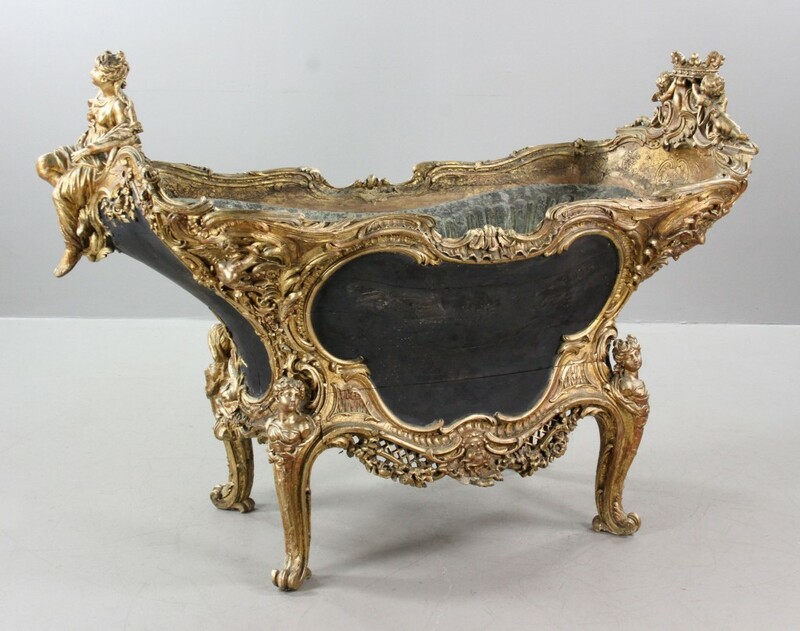 gold-plated bronze French figural centerpiece bowl (est. $10,000-$15,000) and a 14 kt. Russian Order of the White Eagle medal, with 87 grams troy weight of gold (est. $20,00-$40,000). Visit www.kaminskiauctions.com. You'll get a charge out of these cloisonné chargers! 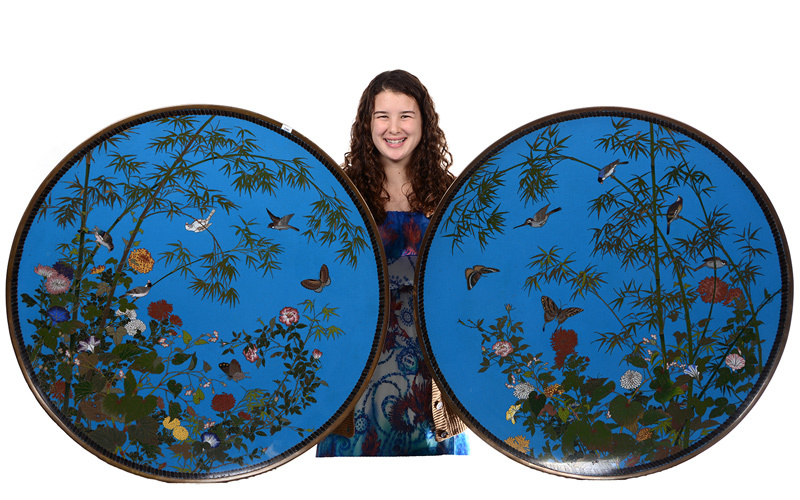 Take a look at this massive pair of vintage cloisonné palace chargers, each one 36 inches in diameter, featuring a beautiful blue background with colorful bamboo, floral, butterfly and bird motif. Each charger weighs more than 40 pounds and will be a featured lot at Woody Auction on Saturday, December 3rd, in Douglass, Kansas. The sale will also feature Native American objects, cast iron toys, art glass pieces, lamps by Tiffany and Handel and much more – 436 lots in all. The mix is eclectic, ranging from horsehair prison art bridles to a Reed & Barton sterling flatware set. Cloisonné is an ancient technique for decorating metalwork objects, in recent centuries using vitreous enamel, and in older periods also inlays of cut gemstones, glass and other materials. The decoration is formed by adding compartments (cloisons in French, hence the name), to the metal object by affixing silver or gold wires or thin strips placed on their edges. These remain visible in the finished piece, separating the different compartments of the enamel or inlays, which are often of several colors. The technique was used in ancient times mostly for jewelry. Visit www.woodyauction.com. (A) SMITH & WESSON MODEL 320 REVOLVING RIFLE.